The BankAmericard Travel Rewards Credit Card currently has an Informr score of 8.5 out of 10. This score is based on our evaluation of 24 sources including reviews from users and the web's most trusted critics. BankAmericard Travel Rewards Credit Card is typically available to those with good credit scores (650 or greater). You can travel anytime you want with this flexible travel card: The Bank of America Travel Rewards credit card sets itself apart from other travel cards by doing away with restrictive travel policies and letting you book your rewards-funded travel yourself. For new travelers, the Bank of America Travel Rewards credit card offers a lot of upside with very little risk. Combining rewards opportunities and generous redemption options, this card gives first-time travelers the chance to see how rewards work and can add up toward free travel over time. For Direct Deposit and Check Cash Advances or $10 whichever is greater. for ATM, Over-the-Counter, Same-Day Online and Cash Equivalent Cash Advances or $10 whichever is greater. It’s actually a very solid choice for a travel card. No, you’re not going to get tons of points or perks like access to lounges and companion fares, but it’s also not supposed to be a premium travel card. There is no annual fee and no foreign transaction fees, so for someone who doesn’t spend a ton on credit cards and wants to pick up some points when they’re traveling, this is a great choice. 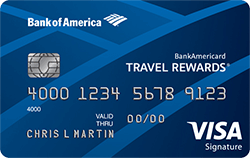 The Bank of America Travel Rewards Credit Card has a lot to offer if you travel a few times per year and aren’t loyal to one airline or hotel chain. It’s worth a look if you don’t spend enough in a year to justify the annual fee on a premium travel rewards card. But more lucrative cards for frequent travelers both earn strong rewards and provide a host of terrific travel benefits. This card is best for someone who takes occasional international trips, but is not the most frequent flier. Thanks to the EMV chip, no foreign transaction fees, and $0 fraud liability, this card is excellent for a trip nearly anywhere in the world. And if you save up your rewards, you can get there for free. The travel rewards credit card is a solid rewards card. You get a lot of great perks and a few drawbacks. It’s a no-frills card with a flat rewards rate. Also, it’s also widely accepted and doesn’t have an annual fee. For people who don’t travel a lot, it’s worth checking into. The best no-fee travel credit card is especially rewarding for Bank of America banking customers. A very good option for people with excellent credit who want to reduce the cost of travel without paying an annual fee. But it’s only a truly great choice for fairly low-spending Bank of America banking customers with a lot of cash saved. The BankAmericard Travel Rewards credit card is good for anyone who wants to earn statement credits toward travel purchases. This card has no transfer partners, but it does have a generous earning scheme, a decent sign-up bonus and no annual fee.